Crafted from durable, incredibly lightweight Dyneema composite fabric, the Hyperlite UltaMid 2 Tent provides enough shelter for two yet weighs scarcely more than an iPad. Fully seam sealed, it's suited to sub-par conditions, and its pyramidal shape is surprisingly wind-resistant. Available in white or Spruce green and made in the USA. Nicknamed 'The Beast,' this 66" toboggan is equipped to carry up to 4 children or 2 adults. The sled is designed and made in the USA using safe and tough arctic camouflage polyethylene plastic ensuring it can stand up to below zero temperatures without cracking. And if a sledding adventure isn't your idea of fun, the toboggan can also be used to haul tools, wood, or hunting supplies across the snowy terrain. In extreme conditions, you need more than a thick sleeping bag. This heated camping mat uses an automatic hot water heating system to make sure you stay warm regardless of your environment. In storms, heavy rains, and temperatures way below zero, you're able to stay at a toasty temp without external power. It's also lightweight and can be stowed in your pack, even if you're scaling a mountain. As long as it's cold enough, building your own backyard hockey rink is now possible. This self-standing and self-stabilizing rink from EZ-Ice can be set up on any semi-flat surface like a tennis court, driveway, or backyard in less than an hour. It's constructed using 5-foot lightweight panels that snap into place. It's then secured using a bracket and strap system that eliminates the need for stakes in the ground. Available in widths and lengths to suit your space in any increment of 5 feet. Even if you've camped out under the stars hundreds of times, chances are you haven't taken your tent out onto the water overnight. The Shoal Tent gives you that option with an 8′ x 8′ footprint raft that uses three different air chambers to inflate. The floor of the tent is a 6" thick drop stitched high-pressure surface that doubles as an air mattress, and the tent fabric is heavy duty, waterproof, and sealed with high-quality #8 zippers. 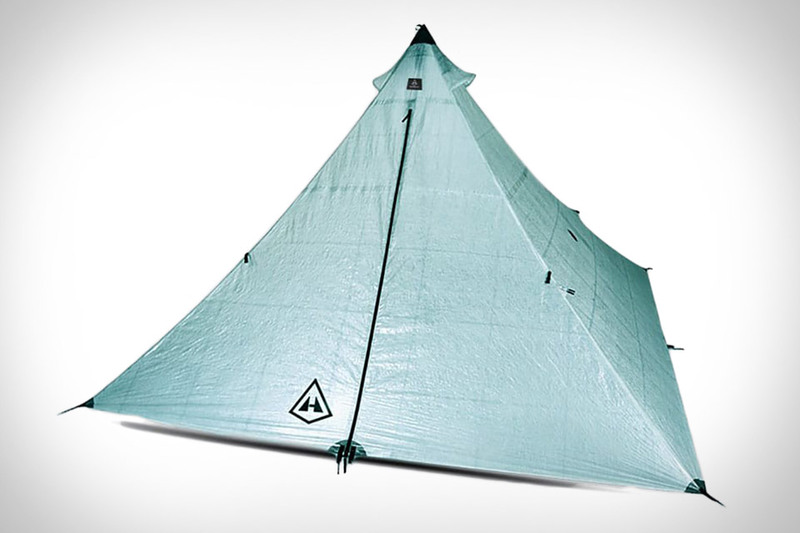 And the tent topper is sturdy enough to stand up to high winds during some unexpected weather as you are lulled to sleep camping on the water. As part of their effort to lessen environmental impact, Othr works with designers around the globe to create great products. The Othr Birdhaus is no exception. Designed by Copenhagen-based Claesson Koivisto Rune, the sleek house provides a home for birds that can eat up to 3,500 bugs a day, reducing the need for pesticides and chemicals. It has an inner and outer shell for easy maintenance, is easy to install, and since it's 3D printed from gloss white or matte black porcelain, there's no manufacturing waste to worry about. Inspired by the shark of the same name, the Mako Slingshot Jetboard is an exhilarating way to enjoy some time on the water. It's powered by a fuel-efficient Rotron XT100 engine producing 15 hp, mated to a high-rpm aluminum jet drive for a top speed of over 30 mph, and a run time of 40 minutes at full throttle. The carbon fiber board is perfectly balanced, with a V-hull design that provides precise control over a variety of water surfaces, and at just 43 lbs., it's easy to throw in the car and carry to the water — no trailer necessary.